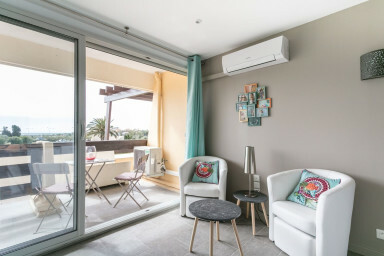 Come relax in paradise in Port Nature in cap d’Agde France off the coast of the Mediterranean. The modern studio apartment is located in the largest naturist village in Europe. The sunny and bright apartment is 4 minutes from the beach, restaurants, bars, and shops. Some of the best places are waiki beach Bar, Melrose cafe, and Le Mississippi restaurant. You have the option to visit these fabulous places or have a good time at the apartment over a few bottles of wine. Whichever way you prefer, there is always an opportunity to have fun. The apartment is newly remodeled and located on the first floor, perfect for overlooking the garden and relaxing on the private terrace. Sleep in late in the large bed with comfy pillows and blankets or wake up early to get to the beach for a nice morning walk. Wash off from the beach or pool in the sleek shower. Feel free to cook delicious meals on your vacation in the fully equipped kitchen. There are plenty of activities and great people to meet in the village. Wifi is available for your use. Feel free to make this apartment your home on your holiday.